a semicircular, triangular, or polygonal window projecting from the side of a building. It usually extends for several stories, sometimes ranging the entire height of the building, in which case it usually does not include the ground story. The provision of bay windows increases floor space and improves interior illumination and insolation. A window that projects outward from the wall of a building and forms a small indoor alcove. 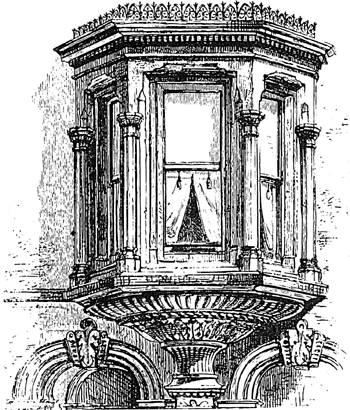 A window that protrudes from a wall, usually bowed, canted, polygonal, segmental, semicircular, or square-sided in plan; typically one story in height, although sometimes higher; occasionally corbeled out from the face of the wall, as an oriel; Also see angled bay window, bow window, cant window. A sitting room has a leaded bay window to the back, feature brick fireplace and timber mantle and more decorative beams. Application ref: R/2013/0238/FF Validation Date: April 3 Address: 9 Coxmoor Way, New Marske Proposal: Single storey extension at side and installation of bay window in lieu of french doors at rear. The Faringdon, also a three-bedroom house, features a dual aspect lounge with French doors to the back garden, a fully fitted kitchen and a separate dining room with feature bay window. Upstairs, there is a family bathroom and four bedrooms, of which bedroom one has a bay window, fitted wardrobe and an en-ssuite shower room with a stylish, modern suite. The wave tracking system is essentially a curtain pole that curves around the shape of your bay window, giving flow and style and instantly adding a modern but elegant look to your room. The sitting room features a bay window and a cast iron fireplace with timber surround. Bay windows - A bay window is built into the external wall of the house, so the room extends into the bay. Additionally this floor includes an oversized kitchen and dining area, breakfast nook with east facing bay window, a guest room and a guest bath. Enter this house to find a formal dining room graced with hutch space and a bay window. The living room has a deep bay window which enhances natural light. During my 15 years as a carpenter, I built a lot of bay windows for a lot of people for a lot of reasons.